The 2019 season is the third edition of TVS Ladies One Make Championship. Selection rounds to be held in Bengaluru and Mumbai on February 9 and 23, respectively. Participants are required to pay an entry fee of Rs 1,000 and bring their own DOT or ECE-approved full face helmet. Participants will receive training from TVS Racing’s top riders and also get to familiarise with the race-tuned Apache RTR 200 4V at these venues. What started off as an all-women racing academy in 2016 has bloomed into a competitive track racing series called the TVS Ladies One Make Championship. The focus has always revolved around spotting and nurturing talented women riders in a bid to expedite their entry into mainstream racing. The sport has managed to pique the interest of women in the country, with TVS enlisting an increasing number of enthusiastic participants for the training and selection process every year. Due credit also goes to racers like Aishwarya Pissay, whose achievements have motivated aspiring women riders to take the leap of faith. The selection process for the championship will be held in Bangalore and Mumbai. It comprises of a full-day training school. All participants are required to possess a valid driving licence and arrange for their own full face helmet a with double D-ring certified from DOT and ECE. There will be a limited number of racing suits available at the venue, but it is advisable to bring your own gear. The Rs 1,000 registration fee includes the cost of the training session, breakfast + lunch, track time and a TVS Racing t-shirt. Best of all, the riders will get to ride astride TVS’ racehorse - the race-tuned TVS Apache RTR 200 4V - at both venues. For more information, refer to the press release attached below. 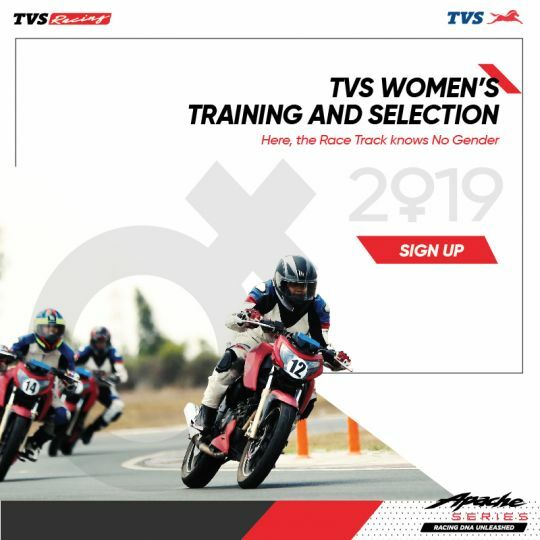 Bangalore, January 28, 2019: TVS Racing, the factory racing arm of TVS Motor Company, is inviting aspiring women racers to participate in the 2019 edition of the Ladies One Make Championship. The selection rounds will be held in Bangalore and Mumbai on February 9th and February 23rd respectively. These sessions will include a full day training school conducted by national champions of TVS Racing to ensure riders are familiarized with their race tuned TVS Apache RTR 200 4V Race Edition 2.0. Safety (Mandatory) - Full face Helmet with visor & Double D ring strap with DOT & ECE certification. Limited racing suits available on first come basis.